Where is the picture taken? Mary Jane Lodge (known as Jennie) was a Voluntary Aid Detachment (VAD) nurse from 1913 till at least 1918, She was from Sutton in Ashfield. On the photograph she is stood at the end (left) of the middle row. She always told her family she was a nurse at Clipstone Camp, however she must have spent time at other hospitals before going to Clipstone as the camp hospital did not open till 1916. 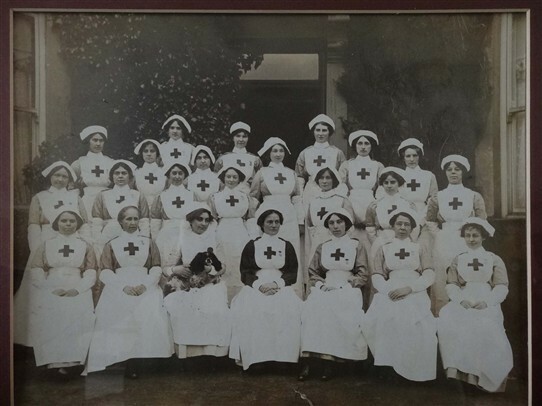 There were many VADs training and nursing in Nottingham from at least 1911, at the outbreak of WW1 some would have stayed in the area while others opted to go further a field including France. Sadly the British Red Cross archive do no have any information on Mary Jane lodge. Does anyone recognise the building in this photograph? Jenny & Mary Kitchen, Miss Lily Morley, Mrs Caunt, Andra [sic] Caunt - Wright? This page was added by Pauline Marples on 13/12/2014.